The final Bridgerton book has lost all contact with reality. And you know what? 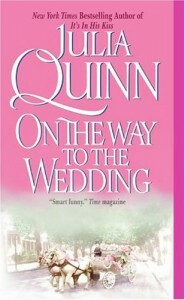 In a frothy hodgepodge of common HR plots, Ms. Quinn ramps up the tension with love at first sight, interrupted weddings, treason, kidnapping... Really, it's a wonder there's anything left to pull our HEA out of! I liked the choice to start each chapter with the little fourth-wall breaking narration, though it did give away the "mystery" of the prologue. It helped separate the story from the other siblings, which is good, because I found Gregory to be written exactly as Colin. Now Colin's a charming rogue and it's hard to write four boys and four girls in totally separate ways, but even when I compared Daphne and Eloise, I didn't feel like they were the exact same character. Still, there's a lot to like with multiple cameos from other family members, a good love scene, plenty of intrigue and a good dose of silliness.